There's a reason why breast augmentation is one of the most popular plastic surgery procedures performed every year. It can have a dramatic impact on your appearance, helping you achieve the boost in self-confidence that typically comes when you love the way you look. If you'd like to improve the size and shape of your breasts, then breast augmentation may be the ideal solution to address your unique needs and goals. Dr. Dean Kleto has over 25 years of experience performing breast enlargement procedures for women in the Knoxville area. He will listen carefully to your aesthetic goals in order to create a customized treatment plan that will achieve your desired outcome. You can learn more about your breast augmentation options and receive individualized treatment recommendations by speaking with Dr. Kleto in person. Please call 865-366-4755 today to schedule a consultation at our Knoxville plastic surgery office. Breast augmentation can help you achieve a more attractive breast appearance as well as a more proportionate and balanced figure. These are by far the greatest benefits you'll experience from breast enlargement, and the primary reasons why most women choose to undergo the procedure. However, these aren't the only benefits you'll receive. While breast augmentation can address mild sagging issues, it isn't the right procedure to correct moderate to severe sagging. In these situations, you may achieve better results from a breast lift. In addition to the aesthetic reasons for undergoing breast enhancement, you should be in good overall health and have realistic expectations for the outcome of your procedure. If you're a smoker, you should plan on quitting prior to your procedure and throughout the recovery period since smoking can adversely impact healing and final results. Is it the Right Time in Your Life for Breast Augmentation? There is no one "right time" to get breast implants. The right moment in your life will depend on a variety of factors. If you're planning on becoming pregnant in the near future, you may want to wait until after you're done having children to undergo the procedure. Breast implants will not impact your ability to breastfeed safely, but the changes to your breasts that occur during pregnancy and breastfeeding can potentially have a negative impact on your results. If family plans aren't in your immediate future, then it's fine to consider getting breast implants now. Similarly, if you are planning on trying to lose a significant amount of weight, you should delay your procedure until you've reached your target weight since massive weight loss can adversely impact on your results. You also need to consider whether your current lifestyle allows you to take the time you need to rest and recover after breast enlargement surgery, and whether it is financially feasible for you at this time. Most women have breasts that are somewhat asymmetrical. This is very natural. However, in some instances the difference in the appearance of each breast can be dramatic. If you experience self-consciousness due to significant breast asymmetry, then breast augmentation may be an ideal option to achieve a more balanced, symmetrical breast appearance. Correcting breast asymmetry depends greatly on the individual. Each case is unique in presentation, so the approach to sculpting or restoring even, symmetrical breasts must be done on a case-by-case basis. Breast augmentation is the most common surgery for correcting asymmetry, but breast reduction or a breast lift may be a better choice for some women. Achieving the beautiful, natural looking breast augmentation results you desire is dependent on several factors. One of the most important is the skill and experience of your plastic surgeon. This will play a major role in the outcome of your procedure. Equally important are the decisions you make regarding the different breast augmentation options available to you. There are several different ways to approach many aspects of your procedure, and the options you choose will significantly impact your final outcome. For additional information, please read our Questions about Breast Augmentation page. Saline implants are FDA-approved for women over the age of 18. They consist of a silicone shell that gets filled with a sterile saline solution. While saline implants do not look or feel as natural as silicone implants, they do offer the distinct advantage of reducing the size of your breast augmentation incisions. Another benefit of saline implants is that in the event of a rupture, the sterile saline solution will be safely absorbed by your body. One disadvantage of saline implants is that they may be more prone to rippling depending on the volume of breast tissue covering the implant. Dr. Kleto has found submuscular breast implant placement can reduce the appearance of rippling, but he may still recommend silicone implants to guard against this aesthetic imperfection, especially if you have minimal natural breast tissue to cover the implant. Silicone breast implants are FDA-approved for women over the age of 22. They consist of a silicone shell that contains a silicone gel material. Silicone implants come pre-filled to the exact specifications determined by you and Dr. Kleto. “Gummy bear” implants are the newest option to be approved by the FDA. They are also available for women over the age of 22 and consist of a silicone shell pre-filled with a form-stable cohesive silicone gel material. These implants provide the most natural look and feel of any option and have become increasingly popular in recent years. Captures a 3D image of your body, letting you see a highly individualized prediction of your outcome. Allows you and Dr. Kleto input various breast implant options, and then you can view a computer screen that will show you how your breasts will look with each option. Allows you compare possible outcomes side-by-side on the screen, up to six images at a time. Most importantly, Dr. Kleto has found that using the inframmary incision location allows him to achieve the most natural looking results possible. Dr. Kleto prefers submuscular placement for a variety of reasons. This option hides the implants underneath the muscles in your chest and is ideal for all types of breast implants. It is by far the best option for women with smaller breasts and insufficient tissue to cover an implant. Dr. Kleto has also found that submuscular placement is ideal for most women, regardless of their natural breast size prior to surgery. Breast implants are measured in cubic centimeters (cc’s), not cup sizes. This ensures a much more standardized unit of measurement than can be achieved by measuring in cup size, which varies from one bra manufacturer to another. Implants range in size from 120 cc’s to 850 cc’s. In smaller bra sizes (32 and 34), it will take approximately 200 cc’s to achieve an increase of one cup size. For larger bra sizes (36 and above), it will take a slightly larger implant volume to achieve a comparable increase. Keep in mind that bigger isn’t always better. In many instances, choosing a moderately sized implant will help you achieve more natural looking results that won’t interfere with an active lifestyle. If you’re a smoker, one of the most important things you can do before breast augmentation surgery is to stop smoking at least six weeks prior to your procedure. Smoking can impede healing, as well as contribute to a host of serious medical problems. In the weeks before your breast augmentation, you should arrange for a ride to and from your procedure. It is also advised to have a responsible adult be with you at home immediately after your surgery. At two weeks before your breast augmentation, you should stop taking anti-inflammatory medications and drugs that can thin the blood, such as aspirin and ibuprofen. Dr. Kleto will provide you with a complete list of medications to avoid. During this time, you should also fill any prescription medications and prepare your home with items such as ice packs to help reduce swelling and discomfort. You may want to have extra pillows handy, as well as books or movies to distract you while you recover. Immediately following your breast surgery you will experience some swelling and discomfort. This will be dealt with through medications provided by Dr. Kleto. Swelling will begin to subside after a few days and will continue to improve over several weeks. During this time, your incisions may continue to feel sore. It is important that you take any antibiotics Dr. Kleto has prescribed, and refrain from taking aspirin or ibuprofen until Dr. Kleto gives you the okay. These medications can increase bleeding. Keep your suture area clean and dry at all times Dr. Kleto allows patients to take a shower on the second day after surgery. You may then replace the breast dressing with a sports bra. Do not use cream or lotions on your sutures. These can increase your risk of infection. You should be able to return to work within 4-7 days. In the meantime, you will want to take it easy and avoid any strenuous exercise. Walking is a great form of mild exercise that you can practice the day after your surgery. Walking will also help reduce swelling and discomfort by increasing blood flow. Rigorous exercise and heavy lifting will need to wait for at least 3-4 weeks. Dr. Kleto will let you know when those activities can resume. Full recovery can take a few months. During this time, it is important that you follow all of Dr. Kleto’s aftercare instructions, and bring any areas of concern to his attention right away. He will schedule appointments with you after one week, again at six weeks, and once a year thereafter. However, he will be available to you should you need him at any time in between these visits. While breast augmentation has an excellent safety record and a low risk of complications when performed by a board-certified plastic surgeon such as Dr. Kleto, it is still major surgery. As with all major surgical procedures, there is some degree of risk associated with it. It’s important to be aware of these potential risks prior to moving forward with your procedure. Dr. Kleto works to reduce your risks of issues such as capsular contracture, bottoming out, and double bubble by using the submuscular breast implant placement technique. This placement will also reduce your risk of interference with future mammograms, breastfeeding, and rippling. Your breast augmentation procedure should deliver beautiful, long lasting results, but it’s important to understand that your breast implants aren’t meant to last forever. As with all medical devices, breast implants will eventually wear out over time, requiring a revision procedure to replace them. Dr. Kleto has more than 25 years of experience performing breast augmentation revision procedures, which are considerably more complicated than the initial breast surgery. He understands the different approaches to revision surgery that are required for the various issues listed above, and he can recommend the right treatment plan to achieve your desired results. 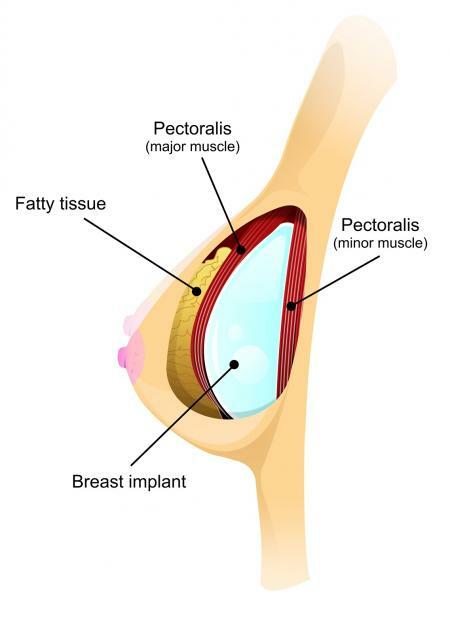 Learn more about breast implants and augmentation surgery in our blog! Please contact Dr. Dean Kleto using the form on this page or call 865-366-4755 today to schedule your breast augmentation consultation. We serve patients in the Knoxville, Tennessee area.